Why Is Your Dog Scratching Ears? What to Do About Dog Scratching Ears? When it comes to ears, you might see many different behaviors in a dog. Scratching ears is one of the most common things a dog will do, but sometimes it means more than just a little itch. Ears that itch like mad can lead to scratching, shaking of the head, rubbing their ears against the floor, and anything else to relieve the intense itch. 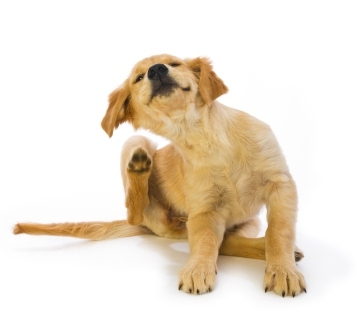 An itch that continues can even lead to terrible pain for your dog. Fortunately, there are many ways to help your dog deal with the itches. A dog scratching ears more often than usual means it’s time to pay close attention and figure out the cause, so you can then do what needs to be done in order to remedy the itch and get your best friend back to his old self. There could be many reasons why your dog is suddenly scratching at his ears all the time. One of the most common reasons why is very simple: fleas or ticks. These tiny parasites can plague a dog and make them feel terrible. Inspect their ears carefully to see evidence of these little critters. Allergies to things that have been inhaled, absorbed or digested can also lead to itchiness, which causes dog scratching ear. Sometimes environmental toxins can touch the ears and wind up causing a serious itch. A yeast infection might occur as a secondary problem to the allergies. Your dog might have some sort of mass in the ear, such as a slow-growing tumor that causes unbearable itching. Bacterial infections often accompany this problem, and those make the itching even worse. Foreign bodies in the ear can sometimes mimic the symptoms of a mass, and can cause the same kind of frenzied scratching. Ear mites are a very common parasite that can bother dogs. Look for evidence of ear mites by turning back the ear and inspecting for brown and crumbly debris. It might appear like a dark crust over the skin. Your dog’s ears might also be red and inflamed around the area. A dog who is constantly scratching his ears needs immediate attention. Start by looking into the ear, using a flashlight if necessary. If the dog refuses to allow this, it could be because the itching has progressed to pain, and that means going to the vet immediately. If you notice that your dog has some sort of infection in the ear, you will likely need medication. But if it appears to be dirt in the ear, or a foreign object, do your best to remove it with a gentle touch and warm water. If that is not the answer, look at your dog’s recent eating habits. Is there something that could be causing allergies? How about the environment? For instance, a dog who spends a great deal of time outside might have allergies to the fertilizer you put on the lawn – not using it might be enough to stop the itching. If you see any parasites, wounds, lesions, or other problems, play it safe and take your dog to the doctor before the problem gets any worse. The treatment for a dog scratching his ears depends upon the cause. Sometimes a simple cleaning works, or you might need oral or topical medications to solve the problem. Some dogs might need to be on a restricted diet, and you might need to change their environment. Only a vet can tell you for sure. Check your dog’s ears often to make sure there are no problems. You want to see a smooth, shiny surface in the ear, and it should be pink, not red. Clean the ears regularly to prevent buildup of wax and other issues. Though some dogs are just fine without ever having their ears cleaned, some require it daily – and almost all of them enjoy the feeling. If your dog has hairy ears, keep them very well-groomed, and consider removing the hair with a pair of safety clippers if necessary. If your dog gets into water, dry their ears thoroughly with a towel when they are done with their play. If your dog is scratching their ears often, it’s time to take them to a veterinarian. Remember that early intervention is essential to making sure that your dog gets on the right track to health and that the itch goes away before it drives you both crazy. Server responsed at: 04/22/2019 8:48 p.m.